NEW YORK CITY is the home of independent film and the international proving ground for actors. Its 24/7 energy and culture will inspire you to create and achieve at the highest level. New York Film Academy students are immersed in the heart of this great city which becomes part of their films and their lives. New York is the iconic location for thousands of great films from The Godfather, Raging Bull, Manhattan, and Do the Right Thing to acclaimed television series like Law & Order to Madmen, Girls, and 30 Rock. This city is the muse for filmmakers and actors who are inspired by its extraordinary energy. Martin Scorsese, Woody Allen, and Spike Lee choose New York to make their films and their homes in. New York actors like Robert De Niro, Tina Fey, Ryan Gosling, and Anne Hathaway all draw from its culture and people in the characters they create. 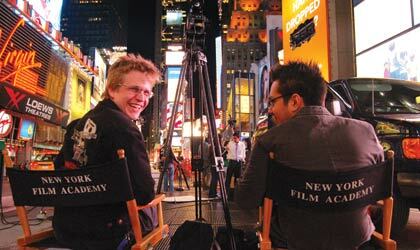 Studying at the Film Academy's location in New York is like living at the crossroads of the world. New York City has a way of thrilling the senses that is as constant and direct as the subways rumbling beneath its surface. For its size, diversity of landscape, people and culture, the city is unparalleled. One can hear dozens of different languages, choose from the cuisine of six continents, and rub shoulders with diplomats, designers, machinists or musicians on any given day. All told, New York City-dynamic, rich in layers, always alive-is the perfect training ground for filmmaking and the related arts. The city challenges and stimulates students on every shoot, every step of the way. New York is a city of distinct pieces: the bustling shops of Chinatown and Spanish Harlem, the stately museums, the neighborhood brownstones. New York is about neon lights, taxi horns, street music, bookstores, landscaped parks, and ten million inhabitants working together-each as unique as the next. Our main New York campus overlooks the Statue of Liberty in Battery Place at the southern tip of Manhattan, in the historic Financial District. The Academy is easily accessible to the rest of the city. A short walk north takes the student into the neighborhoods of Tribeca, Chinatown, the Lower East Side, Greenwich Village, Tribeca, Little Italy, or SoHo. A thirty-minute train ride brings the student to the doorsteps of Columbia University and Harlem, or Coney Island, Central Park, and the Brooklyn Bridge. Our extensive facilities provide a haven from the hustle and bustle, and at the same time, give students a springboard from which to dive straight into the thick of the city's life. Our students shoot in virtually every neighborhood in the city: from SoHo lofts to East Village bars, from Brooklyn delis to Times Square at rush hour. 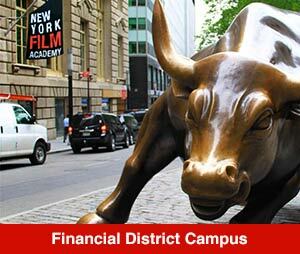 Film shoots—student, commercial, and Hollywood-abound in New York. The support system-production offices, supply houses, actors, theaters, labs, and people—is enormous. Simply by volume alone, New York is indisputably the greatest center of independent film production in the world. Like so many other filmmakers, novelists, playwrights, and painters, our students find that New York itself helps to shape their artistic vision. The city is not only a setting for their stories, but also an active element in the lives of their characters. The New York Film Academy's One and Two-Year Conservatory Programs and our Short-Term Workshops have open enrollment. Serious students from all backgrounds are welcome to apply. No previous experience is required. 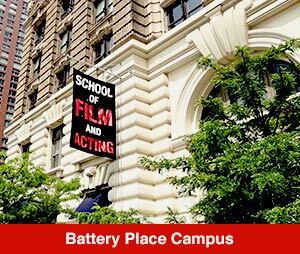 However, all New York Film Academy programs are extremely intensive. Students who enroll should be prepared to live and breathe their work during the course of their studies. Given the nature of filmmaking and the necessity of working in crews, students must be willing to devote themselves not only to their own projects, but to their classmates' projects as well. As space is limited, we recommend early application to guarantee a place in the program of your choice. 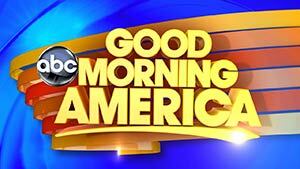 Every program is full-time, with classes, shooting, or project preparation nearly every day of the week. The schedules are rigorous, however, students will have the opportunity to explore the nearly infinite cultural offerings around town. 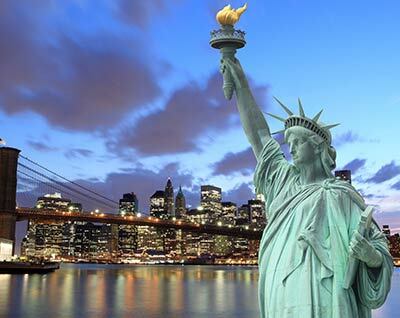 For dining, film, nightlife, shopping, museums, and so much more, New York ranks number one in the world. Opportunities for cultural activities are unlimited. 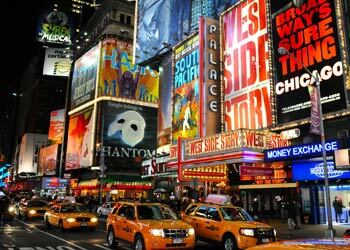 For the film lover, New York is full of mainstream and independent theatres. Films often debut in the city months before they appear in theatres in the rest of the country. 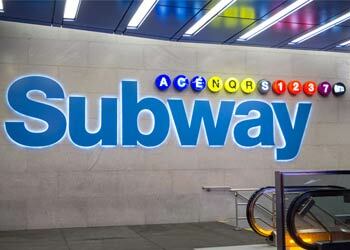 New York boasts many of the world's largest museums, all located a short subway ride away from the Academy. Students will dine in the town of innumerable restaurants, explore the bars and clubs of the West and East Village, Tribeca, Chelsea, and SoHo, and spend hours perusing the many art galleries and bookstores that are scattered throughout the city. Some of the best musicians in the world, from jazz to alternative to classical, play in New York. For theater, students have their pick, from opulent Broadway plays to guerrilla Off-Off-Broadway Productions. Filmmaking students shoot on 16mm, 35mm, HD, and 4K digital video. Producing, Screenwriting, Documentary Filmmaking, Broadcast Journalism, and Acting For Film students all work with digital cameras. All editing in any of the programs and workshops is done digitally using Avid digital editing software. At all of our locales, our eclectic faculty is comprised of experienced instructors and professional filmmakers who have Master of Fine Arts degrees from the most prestigious visual and performing arts programs in the United States. The Academy recognizes that all students are unique, and want to express themselves through their own visions. Whether students are interested in narrative, documentary, experimental, or music video, our faculty will do everything possible to nurture and mentor these future filmmakers. At the conclusion of all programs, a graduation ceremony and final presentation of student work is held. Final Films, Showcase Performances, and Screenplay readings provide a unique opportunity for family, friends and cast to see the work students have produced. Students retain digital master tapes of their film and video work to include in their portfolios. New York City has over 652 synagogues, 659 Catholic churches, 110 mosques, 876 Baptist churches, 40 Mormon churches, 230 Christian churches, 239 Lutheran churches, 231 Methodist churches, 307 Presbyterian churches, and over 6,230 churches of other denominations and over 70 cemeteries. In the 1920s, John Fitzgerald, a sportswriter for the Morning Telegraph, overheard stable-hands in New Orleans refer to NYC's racetracks as “The Big Apple.” He named his column “Around the Big Apple.” A decade later, jazz musicians adopted the term to refer to New York City, and especially Harlem, as the jazz capital of the world. There are many apples on the trees of success they were saying, but when you pick New York City, you pick the big apple. Broadway's Original Name was the Wiechquaekeck Trail. It was an old Algonquin trade route. New York has 26 subway lines, 490 stations, and 660 miles of subway track. There are 6,374.6 miles of streets in New York City and about 6,400 cars. New York City has 578 miles of waterfront. The New York City Department of Transportation is responsible for 753 bridges and tunnels. The world's largest department store covers 2.1 million sq ft of space and stocks over 500,000 different items and makes its home in NYC. Bet you didn't know that New York City is the greenest city in America. NYC has 52,938 acres of park/open space out of 197,696 total acres (26.8%). 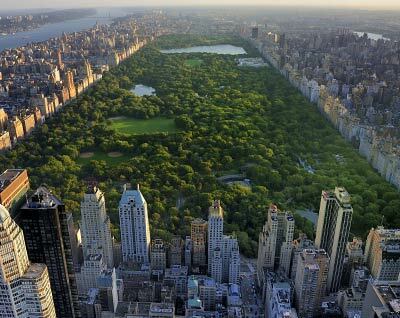 Central Park, Manhattan's famed green oasis, is only number five on the list of the city's ten largest parks. There are more than 750 different native species of animals and plants throughout the five boroughs, including the endangered peregrine falcon, the sharp-shinned hawk, and white tailed deer. Central Park and the Bronx's New York Botanical Garden offer guided bird walks, and spring in Queens brings thousands of migrating shore birds to the Jamaica Bay Wildlife Refuge's 10,000 acres. You are invited to join New Yorkers who jog, walk, bike, in-line skate, horseback ride, ice skate, rent row boats, play basketball, softball, soccer, tennis, and enjoy special events and festivals, in the city's 1,700 parks and playgrounds. Location, Location, Location! 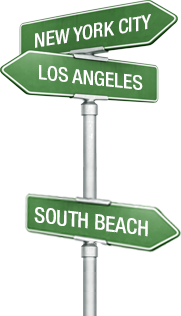 The city has played the setting of choice to some of the most popular and most distinguished films and television shows of all time. It is also home to the largest and most sophisticated world-class film and television production centers on the east coast, such as Kaufman Astoria Studios and Silver Cup Studios located in Queens; and Steiner Studios, at the site of the historic Brooklyn Navel Yard. It is a city jammed full of contradictions and harmony; a city where every passing moment may hold a revelation to destiny, where every turned corner may yield a new journey. It is a place where creatives can arrive with their own unique angle; a place where that angle may offer the potential of lifelong fulfillment. For the artist, New York City is a mecca that is alive with unimaginable hope and inspiration. Here, students find themselves in the center of it all. New York City has always defined its sense of history with some of the most significant cultural and artistic movements, people, and institutions: from the Harlem Renaissance and Langston Hughes to Abstract Expressionism with Jackson Pollack; from Broadway, to Off-Broadway, to Off-Off-Broadway; from the Sony IMAX theater uptown, to the underground short film slams buried downtown. Invigorate your imagination. There are over 180 museums and 500 galleries in the city. 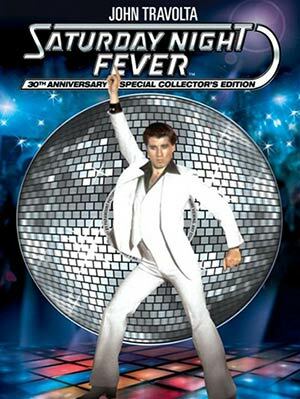 New York is home to over 40 major and independent movie theaters that showcase everything from early-releases of the newest summer block buster, to small-screen indie documentaries to midnight showings of the Rocky Horror Picture Show. With numerous star-studded productions and avant-garde Off-Off-Broadway performances to choose from, the city will never cease to spark and motivate your creative enthusiasm. First film screening in the U.S. The first projected motion pictures ever seen in the United States were shown on the night of April 23rd, 1906 at Koster and Bial's vaudeville house, on the site of today's Macy's department store. Thomas Edison himself helped run the projector. 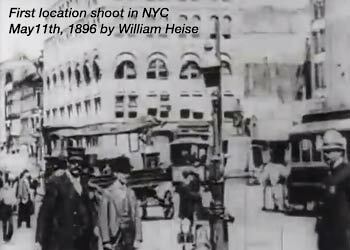 The first movie footage ever shot on location in New York was filmed at 2pm on May11th, 1896 by William Heise, a cameraman with the Edison Company, showing 51 seconds of activity at the corner of Herald Square and 34th Street. The first movie studio in America, the Vitagraph Studio on East 14th Street in Brooklyn, was begun in 1903. Sold to Warner Brothers in the 1920s, then used by NBC Television in the 1950s, it was later the home of The Cosby Show and continues to serve as an active production center to this day. In 1920, Paramount pictures opened its massive east Coast studio in Astoria, Queens. Known as the “big house,” the 14-acre complex contained one of the largest stages ever built, a fifty seat screening room, and a publicity department equipped to handle 10,000 stills a day. Used by U.S. Army Signal Corps during World War II, it was refurbished in the 1970s and 80s, and is known today as Kaufman Astoria Studios. 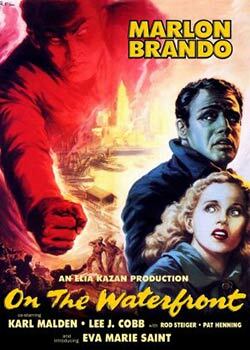 The first modern feature film to be produced as well as filmed in New York and its surroundings, On the Waterfront stunned the Hollywood establishment when it won eight Oscars, including Best Picture, at the 1954 Academy Awards. The following year, the second New York-produced feature, Marty, also won Best Picture and three other Oscars. On the night of Wednesday, September 15th, 1954, over 1500 onlookers gathered on the corner of 52nd Street and Lexington Avenue to watch Marilyn Monroe perform her legendary “skirt-blowing” scene for The Seven Year Itch. The director, Billy Wilder, required Monroe to repeat the sequence through fifteen takes before he was satisfied. In 1987, the tenement building set constructed on a Lower East Side street for the 1987 film *batteries not included looked so realistic that sanitation men removed prop garbage cans in front of the building and passers-by inquired about available apartments; the accuracy of the coffee shop set built on a Tribeca street corner for the 1994 film It Could Happen to You, meanwhile, encouraged several local residents to stop in and ask for a lunch menu.